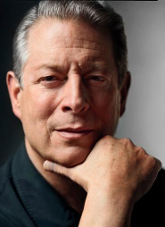 Al Gore: Last week, I had the pleasure of participating in TEDTalks 2016 where I discussed many of the challenges presented by the climate crisis. But a powerful shift has been taking place, and it is clear that we will ultimately prevail. ... There are now only three questions we have to answer about climate change and our future. MUST we change? CAN we change? WILL we change? There are now only three questions we have to answer about climate change and our future. Each day we spew 110 million tons of heat-trapping global warming pollution into the very thin shell of atmosphere surrounding the planet, using it as an open sewer for the gaseous waste of our industrial civilization as it is presently organized. The massive buildup of all that man-made global warming pollution is trapping as much extra heat energy every day as would be released by 400,000 Hiroshima-class atomic bombs exploding every 24 hours. That, in turn, is disrupting the hydrological cycle, evaporating much more water vapor from the oceans, leading to stronger storms, more extreme floods, deeper and longer droughts, among other climate-related problems. Fourteen of the 15 hottest years ever measured have been in this young century. The hottest of all was last year. So YES, we must change! 2. CAN we change? And the answer, fortunately, is now YES! We're seeing a continuing sharp, exponential decline in the cost of renewable energy, energy efficiency, batteries and storage -- and the spread of sustainable agriculture and forestry -- giving nations around the world a historic opportunity to embrace a sustainable future, based on a low carbon, hyper-efficient economy. Indeed, in many parts of the world, renewable energy is already cheaper than that of fossil fuels -- and in many developing regions of the world, renewable energy is leapfrogging fossil fuels altogether -- the same way mobile phones leap-frogged landline phones. And these dramatic cost reductions are continuing! While the answer to this question is up to all of us, the fact is that we already are beginning to change dramatically! In December, 195 nations reached a historic agreement in Paris, which exceeded the highest end of the range of expectations. And the Paris Agreement is just the most recent example of our willingness to act. Much more change is needed, of course, but one of the binding provisions of the Paris Agreement requires five-year transparent reviews of the action plans put forward by every nation, and the first will begin in less than two years, so now is the time to build the momentum for the actions needed. Businesses and investors are already moving. And with the continuing cost-down curves for renewable energy, efficiency and energy storage, it will get easier year by year to win this historic struggle. There are many, many more examples of powerful responses to this moral challenge. They all give me confidence that we are going to win this. It matters a lot how quickly we win, and some still doubt that we have the will to act on climate, but please remember that the will to act is itself a renewable resource. I hope you will take the time to watch the 20-minute video embedded above. And I hope that you will personally take action to "become the change we need to see in the world."